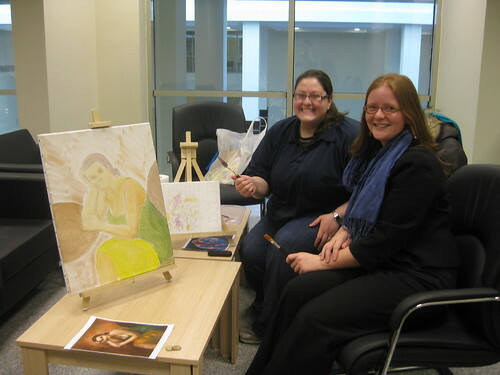 I’ve been attending informal painting classes at the university for about twelve weeks now. It’s been a great opportunity to relax and get to know some of the women living on campus, many of whom are expat wives. Oh yes. I think this may be my career goal. We gather two evenings a week in a barren, bright-lit lounge in the professors’ apartments on campus, and pull out acrylic paints. 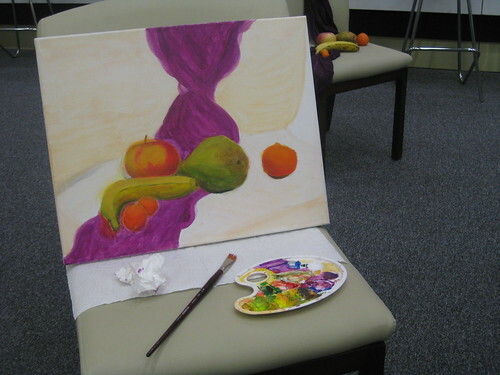 We started with a still life, as below – apple, pear, mandarins, drapy scarf-thing – although I began a few lessons after the other women, and the fruit was all beginning to turn brown and squishy. Super! I’m thinking. A picture of squishy fruit. We’re taught by a local Kazakh art student, Gaziza*, who keeps having me add and change colors, define highlights and shadows. Dogs bark in the hallway as a professor takes his pets out for a walk; his wife Lisa* starts calling to them teasingly, brush in hand, as she dabs more paint onto her still life. 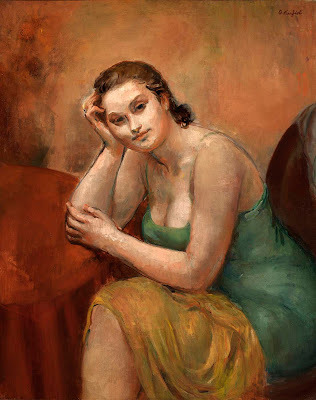 Mine is pallid; hers is intense in greens and yellows and reds, paint thick and stubbed, background deep and dark. She puts the colors of the pear in the lines on the banana, the mandarin on the apple, a manyfold reflection, just how the teacher wants it. Across from us, *Sarah is working on a delicate version of the same fruit, a thin highlight of white on a pear, round shine to her perfect mandarins and delicate yellows and pinks on the apple, the rest of the campus blank and finely sketched in pencil lines. It’s a beauty. 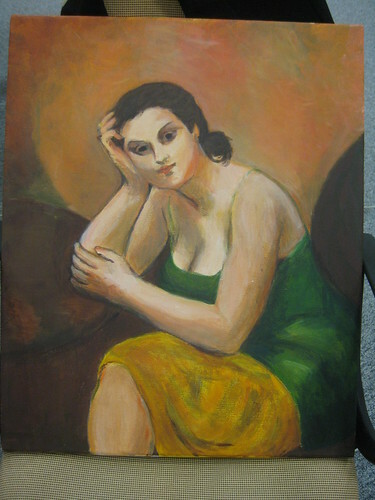 After this we move to copying some other artists’ picture, for practice. Lisa sketches a naked Adonis surrounded by cherubs, and Sarah a psychedelic buffalo. “No you’re not!” She says, and has me layer paint on the canvas, over and over, deepening the shadows and bringing out the forms…. Yeah, ok, maybe she’s right. But Gaziza’s not only trying to make us painters. She also wants to make us beautifully-dressed Kazakhstani women, which she tries to achieve by subtly complimenting our color choices — and our makeup choices. She primps her carefully curled hair, a gauzy scarf wrapped around her neck. She wears Uggs, and short skirts, and sends us meaningful looks. “Why don’t you do your hair?” She complains to Lisa, who has just woken up from a nap. Kazakh girls know how to do fashion. The next week, Lisa and I both dress up for Gaziza. She looks us over when we walk in wearing skirts, careful make-up, and newly cut hair. “And, you should wear heels!” Gaziza smiles. Ih the corner, our Romanian friend Anna* is quietly working on a portrait of a Romanian peasant, sleeved in voluminous, delicate embroidery, a necklace of gold coins, and hands grasping some national fabric to the side. They joke about Lisa’s husband, who finds all our paintings beautiful, and Anna’s husband, who told Lisa directly that her painting was terrible. Finally, Gaziza has us working on our own designs. Above you can see my current project, of a tourist standing beside some sacred stones in west Africa. As we work on this project, we’re joined by more students – Becca, an assertive ten-year-old who details a Pokemon character, and Louise, a British who carefully outlines a still-life in brown and green. 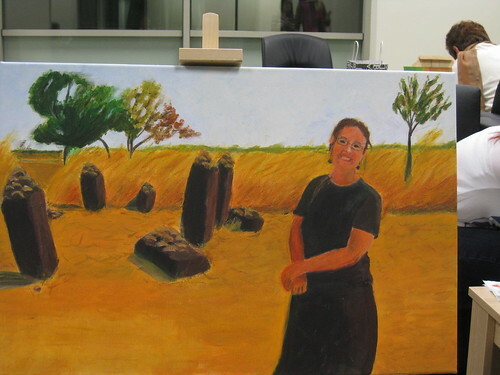 Gaziza wanders over to point out where I should add more color to the trees, more shadows to the stones, how to make my aunt look “less sunburnt.” (If she’d seen white tourists in Africa, she would know the pink is entirely appropriate). “I think I’m done!” I keep saying. “No you’re not… see, you need more form there,” she keeps telling me.